(AllPolitics, November 3) -- Republican investment banker Pat Toomey picked up the open 15th congressional district seat in eastern Pennsylvania, taking it out of Democratic hands. Toomey defeated Democratic state Sen. Ray Afflerbach to win the district, centered on Bethlehem and Allentown in the Lehigh Valley. The seat is being vacated by three-term Democratic Rep. Paul McHale. Toomey, 36, beat two more conservative opponents in the primary, and he was a favorite of the business community. 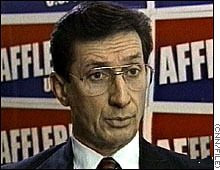 Afflerbach had support from organized labor but portrayed himself as a moderate during the campaign. With polling suggesting the race would be close, Afflerbach's campaign stressed getting Democrats to the polls, using phone banks staffed by the teachers' union and AFL-CIO members. Even more than in many districts, observers saw turnout -- whose voters actually voted -- as a key to the outcome. President Bill Clinton's troubles also touched the race. McHale has called for Clinton to resign, and Afflerbach also supported an impeachment inquiry. "I think we need to bring this sordid episode to an end in an appropriate legal fashion," Afflerbach said during the campaign. "Until we do that we are not going to be able to focus on issues that are of great importance to this nation." Gov. Tom Ridge endorsed Toomey. "I spent 12 years down there and I think you've got the right stuff," Ridge told the Republican candidate at one campaign appearance. 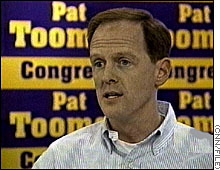 Toomey is a veteran of a British investment bank, who moved here to found a string of restaurants. Afflerbach, 53, is a Kutztown University man, a veteran of the Air Force and has spent 28 years in the Pennsylvania legislature, at first as a staff aide, then a House member, and most recently a state senator. Toomey tried to turn his opponent's experience against him. In one campaign ad, he ran video of Afflerbach saying, "In the years I've been in the legislature, naturally have faced many tax bills. I have voted for almost every one of them." Afflerbach said that was unfair; he voted for tax decreases, too. He attacked Toomey on Medicare. One of his ads intones, "Pat Toomey promised to repeal the law preventing Medicare overcharges." But Toomey's mailings said he would work to save Medicare and Social Security benefits, calling them "sacred." Some of their differences were more petty. Toomey's restaurants are sports bars, but Afflerbach referred to them as "nightclubs" during the campaign. In one appearance, Afflerbach characterized Toomey as "my opponent, nightclub owner Pat Toomey, the same nightclub owner who incidentally is supporting a risky new tax scheme." That was a response to Toomey's call for a 17 percent flat tax. I support a repeal of this current tax code, because I think it's terribly unfair," Toomey said. "It's ridiculously complicated and virtually all economists agree it's very bad for the economy." CNN's Brooks Jackson and political analyst Stuart Rothenberg contributed to this report.